With 12.8 x 2 x 1.2 cm in overall dimensions, the model does not require a whole lot of space in the cutlery drawer. 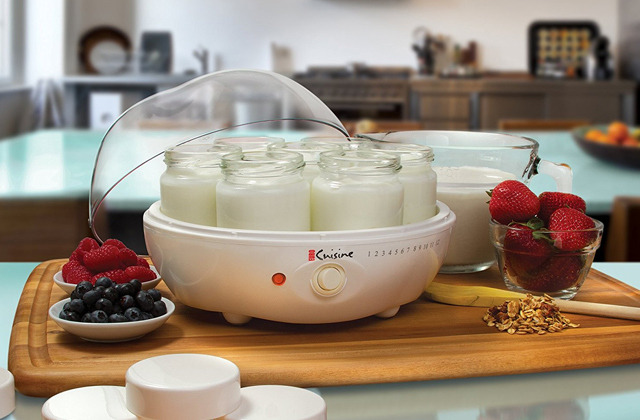 It will let you peel, slice, and grate a variety of different fruits, vegetables, tubers, and other food items. 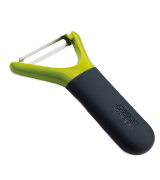 The two-sided design makes the peeler equally suitable for left- and right-handed individuals. The tool is not dishwasher safe. Victorinox Double Edge might just very well be the best potato peeler in this review and easily one of the better models around. The model's versatility makes it an excellent addition to any cutlery drawer. The wooden handle, with a linseed oil finish, is not susceptible to moisture. 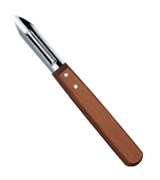 A tough scraping blade will help you with carrots and other vegetables and fruits that require scraping. 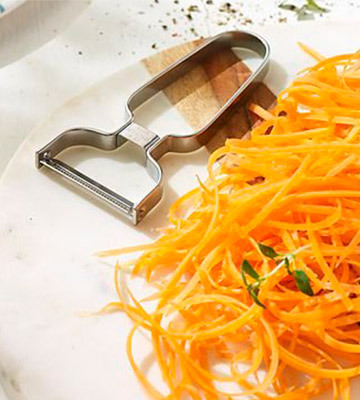 The tool can be used as a spiralizer to make courgettes or swede noodles. The peeler comes with a nice little blade protector, so you'll be able to keep your fingers safe and the blades nice and sharp. The green top part is a little flimsy. Why purchase 3 different tools that take up a lot of space when you can get Joseph Joseph Multi-Peel Y-Shaped Peeler instead? 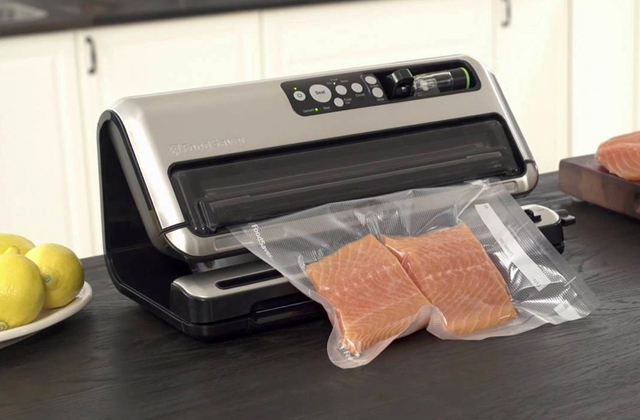 It will let you slice vegetables into thin strips, making it easy to prepare healthy snacks. Plus, it makes "ribbons" off veggies just as well as it peels them. 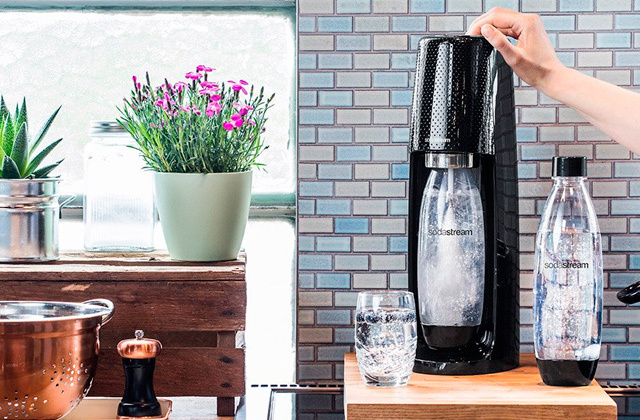 The model's oversized handle works wonders absorbing strain from your hands and wrist. Even with repetitive strokes, it should prove comfortable and practical enough. The blade is sharp enough to glide through the toughest fruit and vegetable skins with relative ease. The tool comes fitted with a hanging loop. The blades get dull relatively quickly. 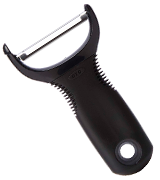 OXO Y-Shaped Peeler is a really affordable tool with a well-thought-out design and excellent utility. An experienced cook will definitely be able to put it to good use and even some of the least experienced people who seldom cook themselves could benefit from having this tool in the kitchen. The single-cast, deluxe mirror polish makes the tool look stylish and elegant. 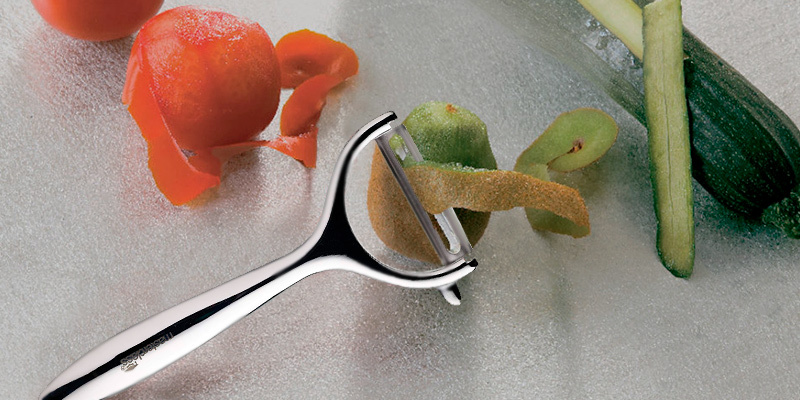 The swivel-headed design allows the blade to easily remove the most stubborn fruit and vegetable skins. The heavy-duty steel construction is tough enough for effortless daily peeling. 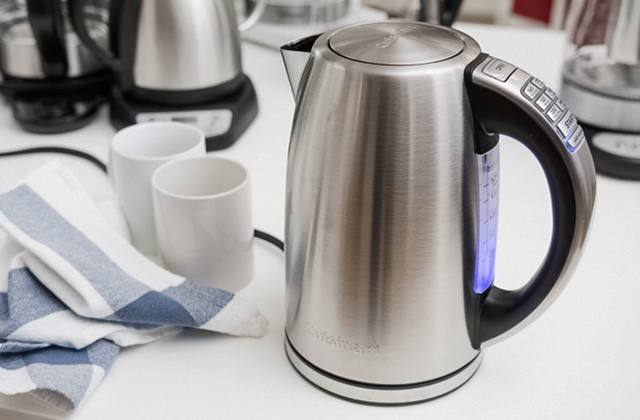 The sleek polished handle is ergonomic and practical. The polished steel handle is susceptible to scratches. KitchenCraft MasterClass will be able to class up any kitchen drawer. But even though this potato peeler has plenty of style, its functionality is just as impressive. The model will unlikely ever deform and should serve you for a really long time. The matchstick style cutting is perfect for making matchstick-sized strips of carrot or courgette. It will help you prepare coleslaw, salads, as well as stir-fries. 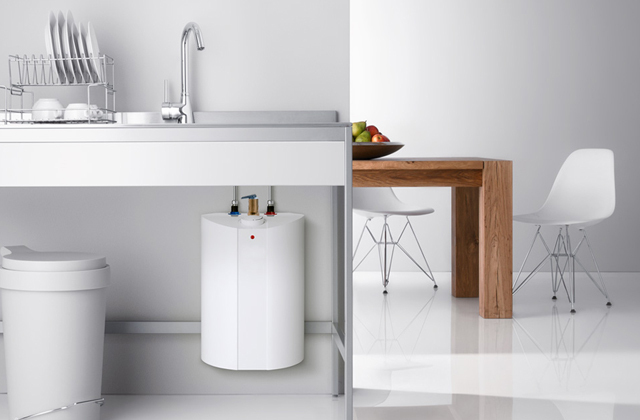 The 18/8 food-grade stainless steel doesn't have nor leave any sort of smell or scent. 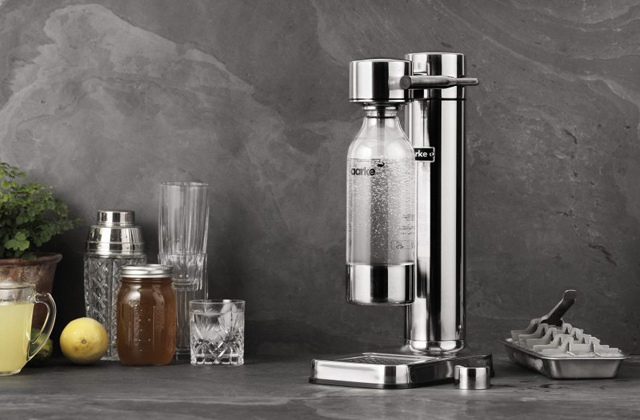 It is corrosion-resistant and dishwasher safe. Doesn't include a potato-eye remover. We would recommend Lakeland Sharp Peel Julienne Y Peeler to people who love cooking first and foremost. 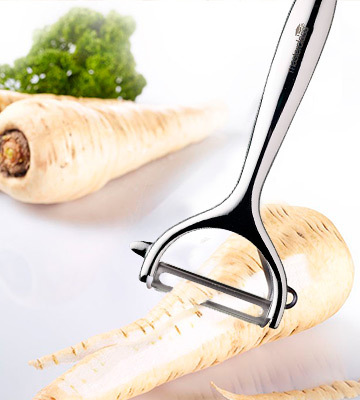 With this peeler, you'll be able to showcase your culinary skills and treat your loved ones to the most delicious dishes. When you think of a good potato peeler that can do so much more than just peel potatoes and will be a good addition to any cutlery drawer, you think of a model like Victorinox Double Edge. Since it is just 12 centimetres long and around 2 and 1.2 centimetres wide and tall respectively, it does not require a whole lot of space in the said drawer. 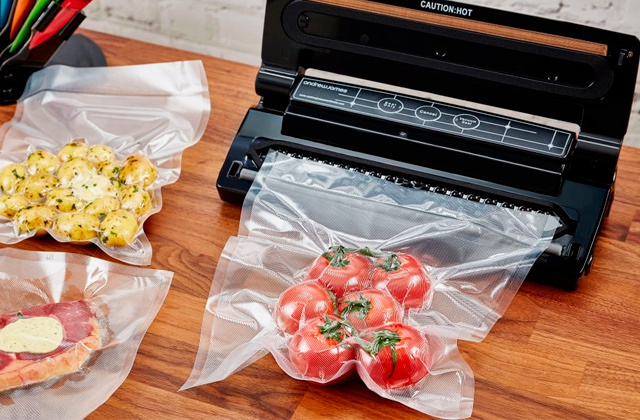 The definition of versatility, this tool with its simple but effective and efficient design will let you peel, slice, and grate a variety of different fruits, vegetables, tubers, and other food items. The namesake double-edged stainless steel blades are sharp enough to cut through anything, sharp enough for lemons and limes and to make a nice thin peel on carrots and spuds. 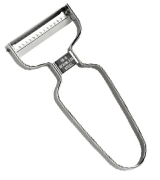 The two-sided design means that the peeler is equally suitable for left- and right-handed individuals. For the most part, the wooden handle is nice and comfortable. People with huge hands may find it a little inconvenient but a larger handle would've made the model too impractical to manoeuvre around small vegetables. The only objective downside to this product is that it is not dishwasher safe, not a huge issue but not something that can be described as a positive either. Apart from that, Victorinox Double Edge might just very well be the best potato peeler in this review and easily one of the better models around. Like we said earlier, the model's versatility makes it an excellent addition to any cutlery drawer. The wooden handle, with a linseed oil finish, is not susceptible to moisture. Joseph Joseph Multi-Peel Y-Shaped Peeler, despite the somewhat silly name, is a really flexible tool. 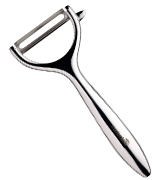 As the "multi-peel" part implies, the model essentially incorporates three peeling tools in a single instrument. 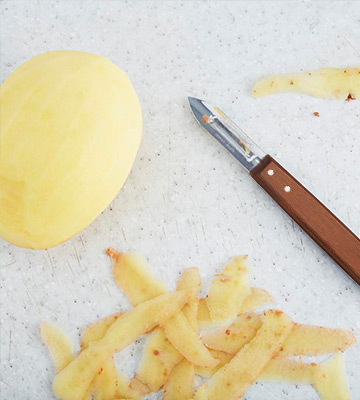 A straight peeling blade is the best option for cucumbers, most tubers, and a few other different items. A tough scraping blade will help you with carrots and other vegetables and fruits that require scraping. 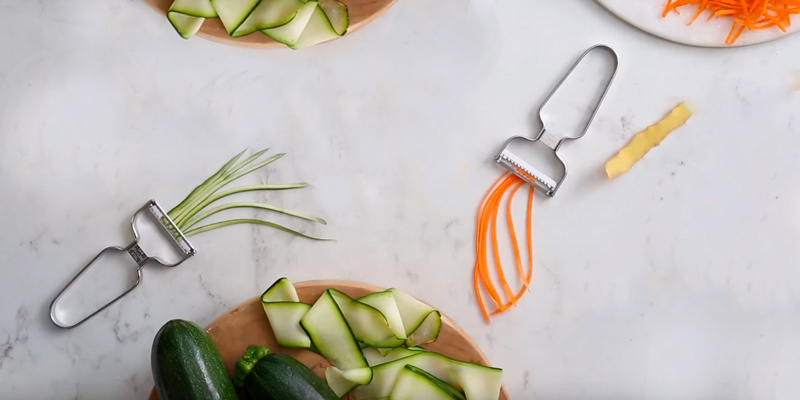 The tool can be used as a spiralizer to make courgettes or swede noodles. And, of course, the potato eye remover will help you easily remove the eyes from your potatoes. The plastic handle incorporates a nice rubber grip that's soft to the touch. Plus, it makes the tool dishwasher safe, unlike its wooden counterparts. Though plastic is seldom as tough and durable, the tool is mostly sturdy enough. Though that green top part that holds the blades is a little flimsy, so you might want to be careful with it. By the way, the blades are really sharp so, again, proceed with the necessary caution. Fortunately, the tool comes with a nice little blade protector, so you'll be able to keep your fingers safe and the blades nice and sharp. 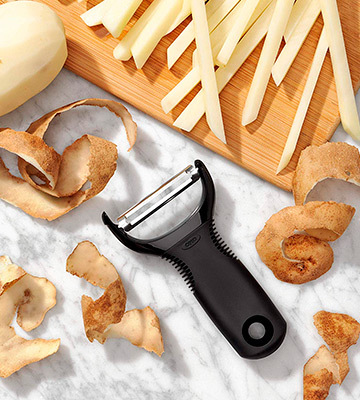 In other words, why purchase 3 different tools that take up a lot of space when you can get Joseph Joseph Multi-Peel Y-Shaped Peeler instead? 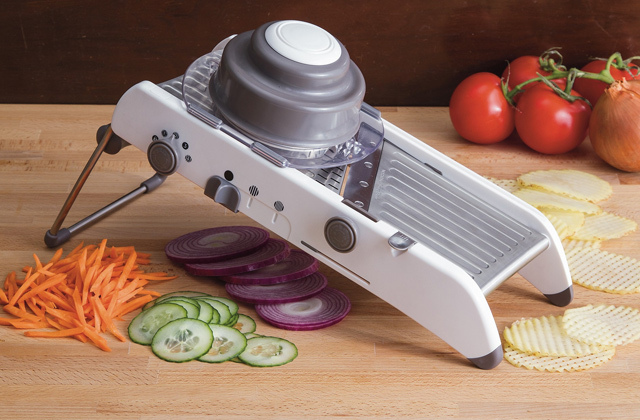 This professional and highly portable tool will let you slice vegetables into thin strips, making it easy to prepare healthy snacks. Plus, it makes "ribbons" off veggies just as well as it peels them. Though OXO Good Grips Y Peeler at less than 5 quid is a really affordable budget model, it does have quite a lot going for it. Sure, it isn't without its flaws either. But, as far as we're concerned, the only issue with the tool is that its blades get dull relatively quickly. But, with a proper sharpener, it shouldn't prove much of an issue. Other than that, this is a really good tool, especially in the design department. The model's oversized handle works wonders absorbing strain from your hands and wrist. Even with repetitive strokes, it should prove comfortable enough. 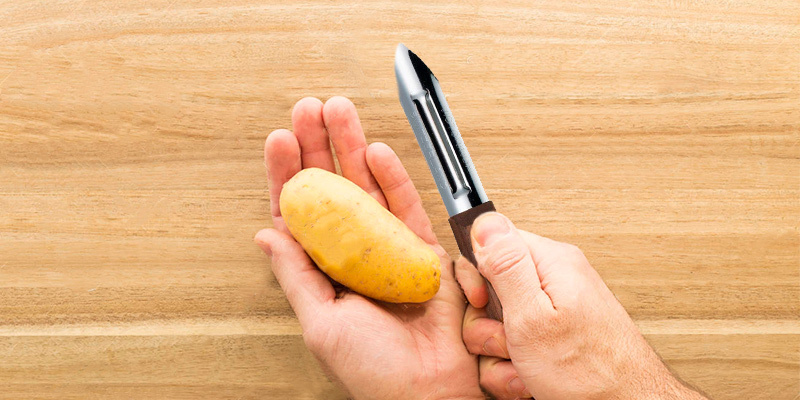 The peeler comes equipped with a potato eye remover, so you'll be able to prepare fingerling potatoes as well as the new ones. And even though the blade gets dull a little too fast for our taste, it is sharp enough to glide through the toughest fruit and vegetable skins with relative ease. The aforementioned plastic handle makes the tool dishwasher safe, simplifying maintenance and making the peeler a real pleasure to deal with. Don't have enough free space in your cutlery drawer? The model comes fitted with a hanging loop, so you can just hang it somewhere around the kitchen instead. 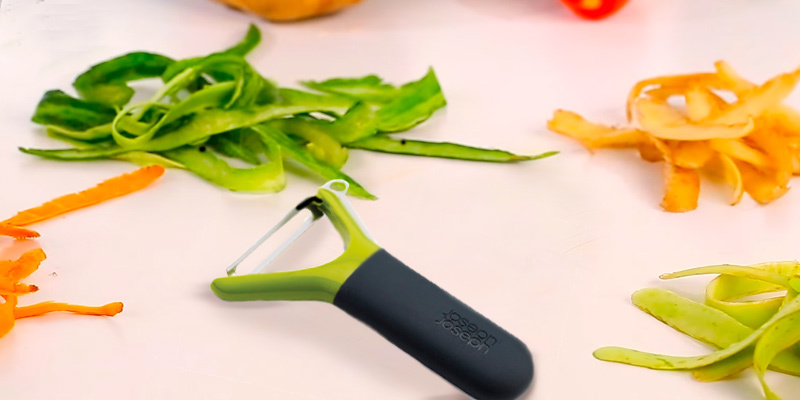 To sum it up, OXO Y-Shaped Peeler is a really affordable tool with a well-thought-out design and excellent utility. 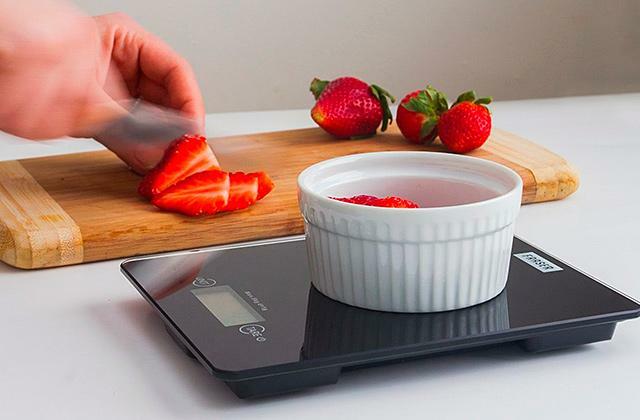 An experienced cook will definitely be able to put it to good use and even some of the least experienced people who seldom cook themselves could benefit from having this tool in the kitchen. KitchenCraft MasterClass is only a pound or two more expensive than your average peeler but, as you can tell from the images, it does not look like them whatsoever. Instead of plastic, the whole thing is made of polished steel. The single-cast, deluxe mirror polish makes the tool look stylish and elegant, far more elegant than what you'd expect from a relatively cheap piece of kitchenware. And though the mirror finish gives the model plenty of style, its functionality does not trail behind either. 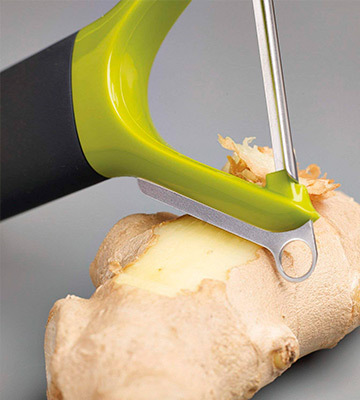 The swivel-headed design allows the blade to easily remove the most stubborn fruit and vegetable skins. The heavy-duty metal construction is really tough and strong enough for effortless daily peeling. The aforementioned single-cast design is also the biggest keys to the model's long-lasting durability. Though it may not seem like it, the sleek polished handle is really ergonomic and practical, practical enough to let you maintain a tight but comfortable grasp. Frankly, the only issue we have with the tool lies with the very same mirror-polished finish. Though it definitely makes the model look good, it is also susceptible to scratches, so it will be difficult for you to maintain the tool's sleek appearance. Long story short, KitchenCraft MasterClass will be able to class up any kitchen drawer. But even though this potato peeler has plenty of style, its functionality is just as impressive. The model will unlikely ever deform and should serve your home for a really long time. Lakeland Sharp Peel Julienne Y Peeler is probably the most interesting peeler on this list. It's not like it is worse than other models here, just that there is an aspect of it or two that could use some improvement. Not a dealbreaker but the tool does not incorporate a potato eye remover, something that will hopefully be added with the next version. But it is not as if the peeler does not offer anything in return. Its design that allows you to utilise matchstick style cutting is perfect for making matchstick-sized strips of carrot or courgette. It will help you prepare coleslaw, salads, as well as stir-fries. Though it will just as well let you handle tougher vegetables like butternut squash or zest lemons and limes. It may not look the part but the potato peeler is surprisingly sharp. The blades, efficient and precise, literally glide with the lightest touch. 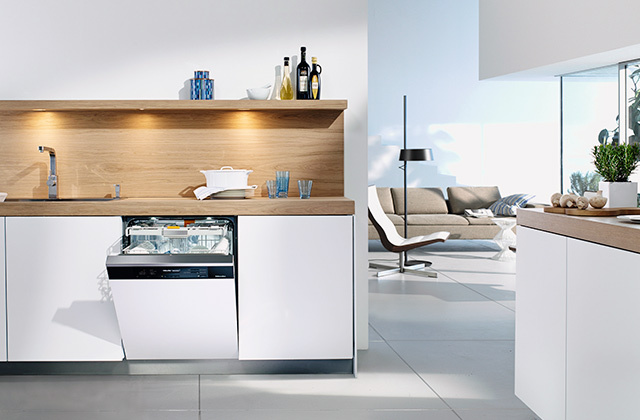 By the way, the 18/8 food-grade stainless steel construction is easily the best option for the kitchen. It doesn't have any kind of scent and does not "contaminate" your food with any uninvited tastes. 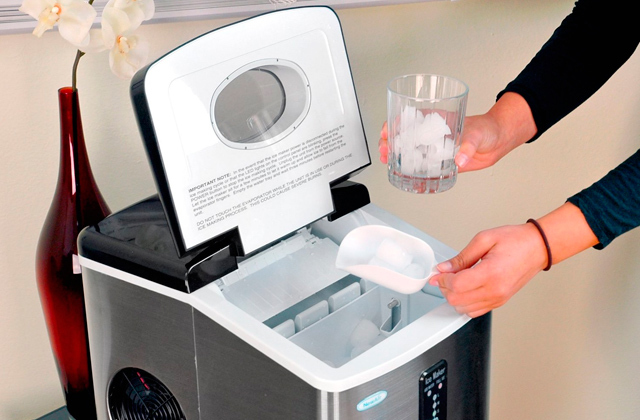 Plus, it is corrosion-resistant and dishwasher safe. Taking all of the above into account, we would recommend Lakeland Sharp Peel Julienne Y Peeler to people who love cooking first and foremost. With this peeler, you'll be able to showcase your culinary skills and treat your loved ones to the most delicious dishes. What Is a Potato Peeler? Potatoes are the swiss army knife of ingredients. They're easily the most versatile food. On top of that, it is probably the only food (definitely the only accessible one) that people can live on as their only food choice. Potatoes don't just contain the necessary carbohydrates and protein but also fiber, minerals, and vitamins. Basically, the only thing you need other than that is salt but it is more seasoning than food and it goes just as well with potatoes as it does with any other food item. That's precisely why recommending a potato peeler was a no-brainer of a decision. 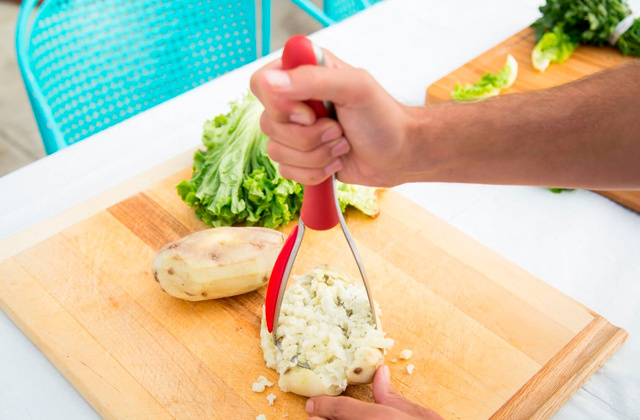 First and foremost, a tool like that will help you peel potatoes. Shocker, we know. On top of that, it can be used to peel various fruits and vegetables, from apples and pears to carrots and beetroots. These peelers have very little variation between different models. The handles may be made of different materials, the blades may feature a different design, the size may vary but, at the end of the day, any one of these tools and especially the models in this review can do their job, so it is really more about personal preferences than anything else. Looking to update your cutlery drawer? Our reviews of steak knives, chef knives, and knife sharpeners will be a good place to start.